For a full day of family fun, drive or take the Aerial Tramway up to Ober Gatlinburg! This popular Smoky Mountain attraction features all types of amazing outdoor activities, including a thrilling Ski Mountain Coaster, Wildlife Encounter, Alpine Slide, Scenic Chairlift, Carousel and more! One of the highlights for kids is the Arcade and Redemption Center, which features everything from interactive driving games to classic games and air hockey. Try your luck at the redemption games where you can win tickets to redeem for all types of great prizes! Another one of the top arcades in Gatlinburg is Fannie Farkle’s, where you can smell the aroma of delicious food as soon as you walk through the door! After enjoying one of the legendary all beef hot dogs, cheesesteaks or sausage subs, head into the arcade area for all of your favorite games! This is where you will find classics like PacMan and Skee Ball, as well as the latest games on the market such as SpongeBob, Monster Drop and Down the Clown! Fannie Farkle’s operates on a convenient Game Card system, which eliminates the need for quarters and paper tickets. Simply purchase a game card when you arrive and everything else is as easy as a swipe of the card! The ultimate gaming destination in Gatlinburg is Arcadia, which is easy to find at the base of the Gatlinburg Space Needle! This 25,000 square foot amusement center features more than 100 of the hottest games, including simulators, classic games and more! When you arrive at Arcadia, the friendly staff will provide you with play cards or you can purchase them from one of the many kiosks inside of the arcade. In addition to the video games, you can play the redemption games to try to win as many tickets as you can. These can be redeemed at the largest redemption center in Gatlinburg! 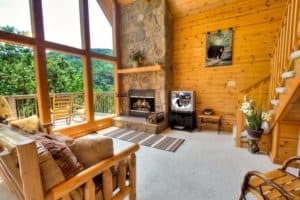 Stay close to all of the video game and redemption action with a family vacation at Auntie Belham’s Cabin Rentals! Our affordable cabins are just minutes from these arcades and all of the other fun attractions, restaurants and shops of downtown Gatlinburg! While staying with us, enjoy a wonderful variety of amenities including fully equipped kitchens, soothing hot tubs, fireplaces and more! You can also take advantage of free tickets to Gatlinburg attractions as a bonus for choosing us for your accommodations! Check out all of our Smoky Mountain cabin rentals today to plan your family vacation near these fun arcades in Gatlinburg! We look forward to seeing you soon at Auntie Belham’s Cabin Rentals!